Two amateur stargazers set out to put a telescope in every Baltimore neighborhood. Imagine walking down a city street at night–making your way to a watering hole in Canton or getting off a train at Penn Station–to discover a group of strangers looking through a telescope. What would you do? 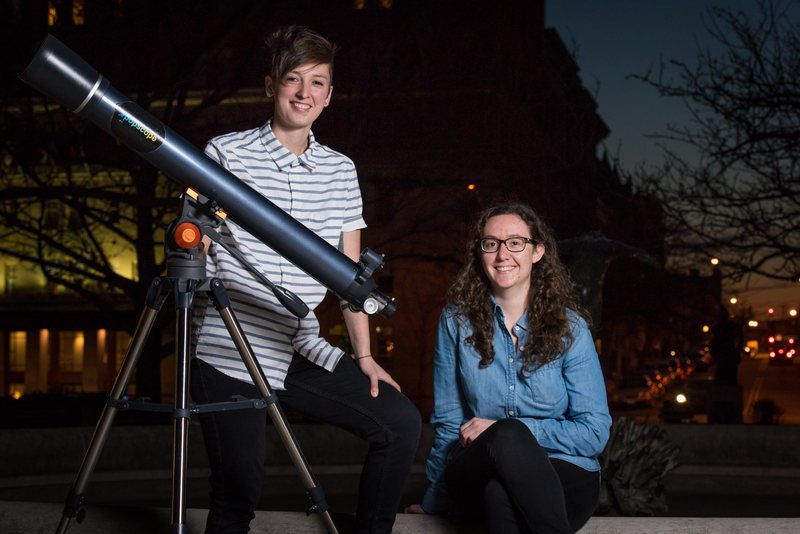 “Most people stop, make a funny face, then ask if they can look through it, too,” says Ariel Hicks, co-director of #popscope, which hosts free weekly astronomy pop-ups all over the city. “Telescopes are an amazing equalizer,” adds Audrey Buckland, her #popscope partner, who has a degree in biochemistry from Missouri Southern State University. No matter how diverse the group is, from a police officer to a grandmother or a kindergartener, everybody seems to have the same reaction. Wow. Neither Hicks nor Buckland knew much about space before this venture, so they recruited a test engineer and an instrument analyst from the Space Telescope Science Institute to serve as expert facilitators–and make sure that any information shared by other volunteers is astronomically legit. #Popscope aims to be a booster for STEM education through partnerships that give Baltimore youth (especially girls and minorities) an equal shot at becoming an astronaut or astrophysicist someday. This summer, they’ll launch a four-week pilot program at Barclay Elementary School to teach kids how to set up and maintain their own telescope. We just want to awaken people's sense of wonder. At their molten-hot core, though, the two longtime friends seem most fired up about the potential unifying power that “looking up together” could have on Baltimore residents–and they’re working with the Social Innovation Lab at Johns Hopkins University to strategize about how to make the greatest community impact…without forcing it. That said, Hicks believes “tough conversations” could organically bubble up, along with the weird (UFOs, conspiracy theories) and wonderful ones already taking place. “A gentleman at Lexington Market recently came up and said, ‘Thank you for coming here. No one comes here,’” she recalls, pointing to his words in a notebook where the team records great quotes from each pop-up.